Which leads into an article I came upon, "Scientists get closer to rejuvenating aging muscles" by Mary Elizabeth Dallas, in Health Day News (which I had never run across before). The report is on a study conducted at Stanford's Baxter Laboratory for Stem Cell Biology. The study takes a very different approach than the fictional lab in my technothriller A REMEDY FOR DEATH, but I thought you'd find it of interest. One thing struck me: "the muscle stem cells in 2-year old mice are the equivalent of those found in 80-year old humans." Implication: maybe there's a market for canes and walkers for old mice! Seriously, the process involves taking muscle stem cells from the oldsters (only mice, so far) and treat them in a certain way, then reimplanting in those muscle groups. Two months later, those muscles were essentiall equivalent to those of young, uninjured mice. Link to the article "Scientists get closer to rejuvenating aging muscles"
The article in Slate is by Will Oremus, and joins other articles we've referenced here, which I'll link to below. My context for interest in articles on the quest for immortality flows from my techno-thriller, A REMEDY FOR DEATH. The book is done and out in the world, but I'm still keeping up with the literature. One key difference between my approach in A REMEDY FOR DEATH and the main trend covered in these articles: Ray Kurzweil's approach is directed to staying alive long enough to be around for what he terms "the singularity," when we have computers and other devices smart enough to in effect download "us" to the cloud. Without spoiling the plot, in REMEDY the characters take a more bio-tech approach, including printing out replacement organs (which is actually under way right now in labs around the world); other bioartificial organs and organ fabrication; the use of stem cells; tissue engineering; and the use of human-animal chimeras. In both REMEDY and the proposed Kurzweil approach arises the small matter of how do you move "consciousness," or "the soul," or whatever you term it across to the new? Business Insider article, "These Tech Billionaires Are Determined to Buy Their Way Out of Death"
See my previous post "New Google division, along with TIME Magazine, follow trail blazed by technothriller A REMEDY FOR DEATH!" That will link you to the TIME cover story on Calico, a new division or subsidiary, of Google. Calico is exploring much the same issues as in my technothriller, A REMEDY FOR DEATH. See also Adam Gollner's article in the Daily Bookbeast, "The Immortality Financiers: The Billionaires Who Want to Live Forever"
From my other blog, MichaelMcGaulley.com. 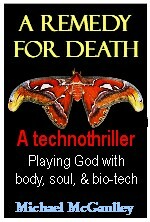 My technothriller, A REMEDY FOR DEATH: Playing God with Body, Soul, and Bio-tech, is about just that: finding a way to overcome aging and death. In the story-line, we explore issues including regenerative medicine, growing replacement human organs and other body parts, other elements of the bio-tech revolution, and reversing the aging process . . . as well as some of the medical and legal ethical issues involved. The core issue is this: What if the terms of life have changed . . . for a certain super-wealthy, well-connected elite? What if today's emerging bio-tech and regenerative medical technologies--including the ability to regrow and implant body parts and organs--offer the chance for another whole go-round in life to a select, secretive few? Intriguingly, this Financial Times also explores that issue, though from a different perspective: "How much longer can we extend life? We just don't know," says Oskar Burger, lead researcher on a pr0ject at the Max Planck Institute in Germany. Dr. Burger's work focuses on how average human life expectancy has lengthened in large part because of relatively mundane things such as better access to clean water, better agicultural technology, and, of course, antibiotics. But what if we take those kinds of advances, then combine them with other bio-tech research (only some of which has been tried with humans)? But then that would raise other problems: will those added years be happy and productive? What about the effect on retirement funds? What about the generational chasm that could develop between the "new" 30-year-olds, and the real 30's who are still working? "Reversing the aging process by using pig hearts"
"Reversing the aging process by using pig hearts" is a post I put up yesterday on my main blog, MichaelMcGaulley.com. For some reason, I am unable to easily link it across, so I'll do it the hard way, because it's very relevant to this blog, and the related technothriller, A REMEDY FOR DEATH. Among the related topics are reversing the aging process, bio-tech, bio-artificial organs, chimeras-- human-animal hybrids, the use of human stem cells, medical ethics, organ harvesting, and organ regeneration-- among others.